GIANNIS Antetokounmpo gave Milwaukee fans the perfect Christmas present by stuffing the stat sheet in a stunning performance against the New York Knicks. The Greek Freak played Santa Claus for the Bucks as they beat the Knicks 109-95. He delivered 30 points and 12 rebounds, as well as three assists, three steals and two blocks - and provided plenty of material for the highlights reel. Beneath the numbers, Antetokounmpo also got his revenge on the Knicks for an incident that happened when the teams clashed earlier this month. NY forward Mario Hezonja dunked on the 24-year-old at the start of December then stared and stepped over him, bringing the Madison Square Garden crowd to its feet. Afterwards, Antetokounmpo said: "I'm going to punch him in the nuts next time." He steered clear of any low blows on Wednesday (AEST) today but the Bucks superstar paid the Knicks back in the best way possible - with a win - even if Hezonja didn't get on the court, robbing Antetokounmpo of the chance to reignite his duel. Late in the third quarter Allonzo Trier drove inside the paint for a lay-up but was savagely rejected by Antetokounmpo, who pinned the ball to the backboard, regathered possession, surged down court and laid on an assist for a George Hill bucket. 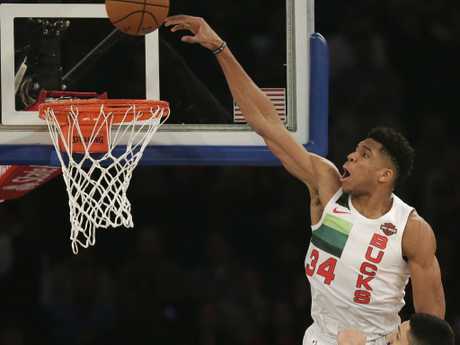 "Antetokounmpo took that Christmas gift away from Allonzo Trier," the commentator said. "What a rejection." Brook Lopez chimed in with 20 points for the Bucks, who played on Christmas Day for the first time since 1977. They were selected for the showcase slate of games largely because of Antetokounmpo, but the timing also was perfect to show an emerging team, which improved the NBA's second-best record to 23-10. Malcolm Brogdon finished with 17 points for Milwaukee, who bounced back from a loss to Miami on Saturday to win for the fifth time in six games. New York has lost five in a row and 10 of 11 since rallying to stun the Bucks 136-134 in overtime on December 1 at home. 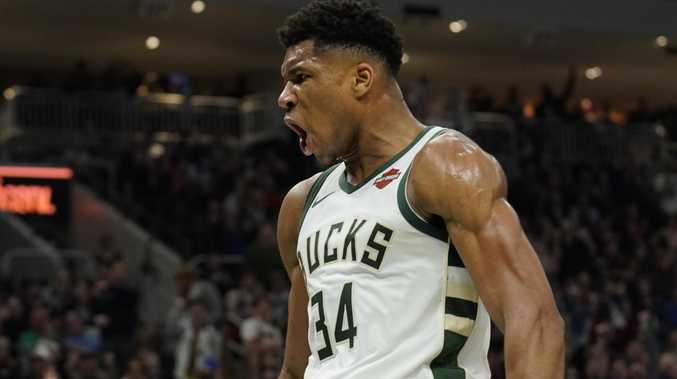 The Greek Freak was perhaps a little too pumped to start the rematch in his search for revenge, missing a dunk so badly on his first shot that the rebound bounced all the way out to the opposite corner, where Brogdon grabbed it and fired in a three-pointer. Antetokounmpo quickly found his groove. But he quickly got untracked, while the Knicks had a hard time getting started in just their third nationally televised game of the season. They started one for eight from the field and fell behind 10-2, though they settled down to lead 24-22 after one quarter. Noah Vonleh had 14 points and 15 rebounds, while Tim Hardaway Jr had 14 points and 10 boards but shot just 4 for 18 for New York.